These lovely candlesticks are a more modern adaptation of a simple wooden candle holder found in many colonial homes. We recommend at least one of each size for a most elegant display. 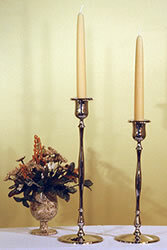 The shorter of these lovely heirloom quality Nickel Plated brass candlesticks measures 10-1/2" high X 4" base. The nickel is extremely durable and will not tarnish. Weight: 14 ounces. For a more formal look with 7/8 inch straight candles, Candle Followers may be ordered by going to our Candle Follower page or by clicking here on Candle Followers.